In a change that took a staggeringly long time to show up in a Pokemon game, the need to sack one or two of your six Pokemon slots for the express purpose of getting you through an underwater cave was FINALLY removed in Pokemon Sun/Moon. HMs were gone at last, replaced by the ability to call in a Pokemon not part of your collection to fly/surf/break rocks/run very fast/for you. Even the classic itemfinder functionality is rolled into this so-called PokeRide system. Though the logistics of the instant-gratification setup aren’t explained very well in the games, the sheer elegant utility – and in some cases added fun – of the whole system more than makes up for any lore gaps. What a relief. Look out, here comes a more subjective bullet point. I always hesitate to dock a Pokemon generation points for being too easy – After all, this is a series built primarily for kids and casual players, and if you apply any of the basic tenets of competitive play to an in-game story run you’ll find a cakewalk in any generation. But I have seen a fair few arguments explaining just how many concessions were made to newcomers in Gen VI over the years, giving it somewhat of a reputation as the series’ weakest challenge. Its successor does not have this problem. The AI is smarter (not a high bar), the Pokemon distribution is tougher and the brand-new Island Challenge plot structure introduces new mechanisms for surprising and throwing the player. 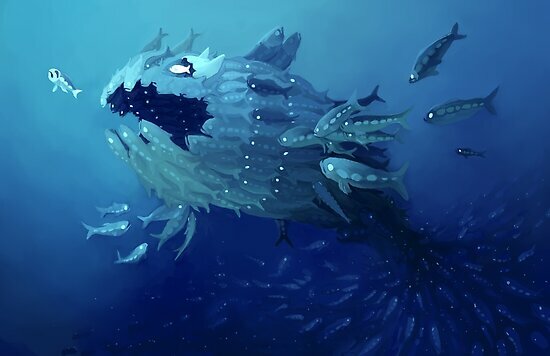 If you don’t have an outright type advantage over the second totem Pokemon boss battle, the titanic amalgamation beast known to mere first-island mortals as Totem Wishiwashi will have your team for breakfast – as it did mine and several of my friends’. Ditto the Lurantis, Salazzle and Mimikyu battles later on. It certainly helps that the generation’s principal new addition to the battle system, Z-Moves, are much more balanced and difficult to obtain than the preceding generation’s most comparable gimmick, Mega Evolutions. And don’t get me started on the Ultra games and their Necrozma shenanigans. They have a case for being the most difficult main series Pokemon games ever. If you’ve been subjected to my loose Pokemon-themed rants in any form you may know that I place an inflated degree of importance on flavour elements in the main games, particularly where the unique characteristics of a region are concerned. 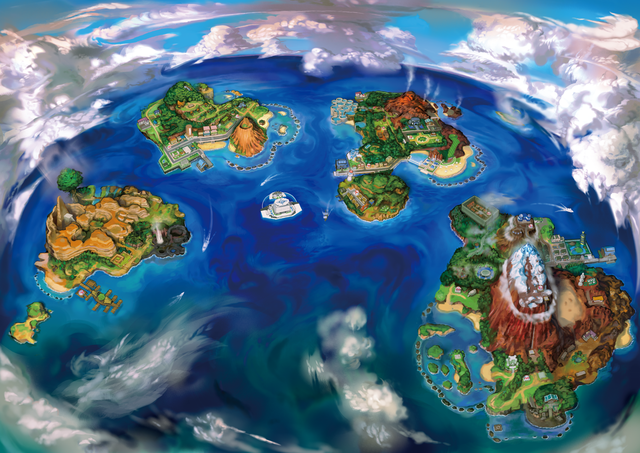 I always enjoy when a Pokemon region feels like it stands out from the others with an identity clearly its own – probably why the sea-and-mountain theming of Hoenn continues to mark it as my favourite region. But as far as the role of native Pokemon goes in making a region feel cohesive, Alola blows all others out of the water. Unlike some older native Pokedex collections, which can feel like a grab-bag of disparate ideas, almost every fresh seventh-generation Pokemon wears its Hawaiian/tropical/holiday vibes clearly in its design. 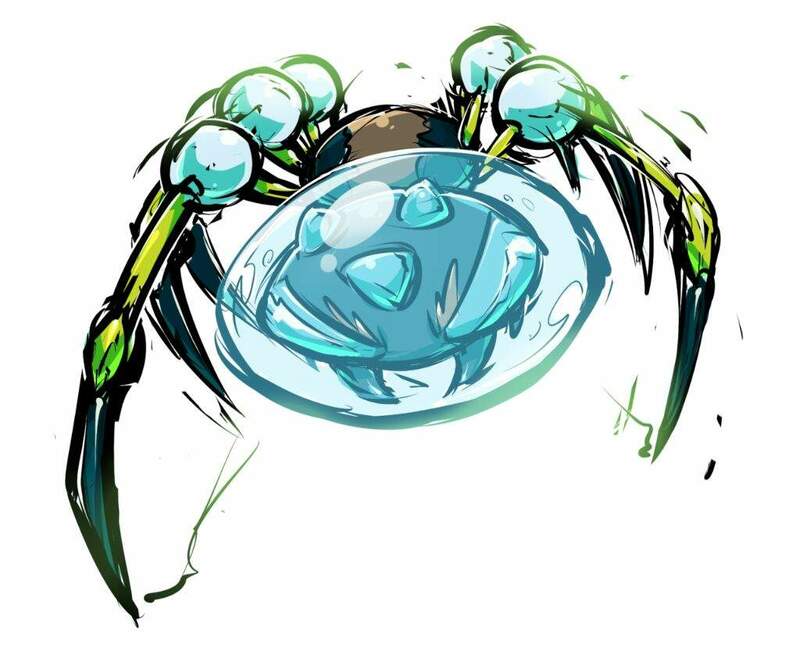 From toucans to sea anemones to sentient leis, Sun and Moon pack a roster of pocket monsters easy to pick out from a lineup, and in Lycanroc, Tsareena and Araquanid they introduced some of my all-time favourites to boot. Of course a local Pokedex can only go so far in giving a region flavour – after all, as of Gen VII the main series Pokemon games are still random encounter-based. But Alola is also somewhat of a landmark achievement in world-building for Game Freak. Shigeru Ohmori’s debut as director of a Pokemon game marked the removal of Pokemon Gyms for the first time in series history, which only accentuates the chilled-out feeling you get while exploring Alola. Most areas have a relaxed, low-maintenance feel, with beaches, hotels, demountables and the odd bit of thatched housing spread throughout the four islands reasonably evenly. The NPC and stock trainer models have the most unified aesthetic of any generation – not to mention the most casually dressed. And in the case of Ultra Sun / Ultra Moon, these NPCs are the stars of more sidequest storylines than in any previous Pokemon adventure. The series has espoused the idea of Pokemon and people living and working together in harmony since the beginning, but never is it more visibly evident than in Alola. It truly feels like you’re on a holiday as you play. One of the biggest complaints levelled at the seventh generation of Pokemon games is their extreme focus on telling a cinematic story packed with cutscenes. The linearity, constant gameplay interruption and perceived slow progression this approach brings to the table can rub people the wrong way. But I don’t mind it one bit (Sorry if you were expecting to see that pop up in the negatives section), because it allows said story to go almost toe-to-toe with the plot of the fifth generation – with a strong message about family and self-expression, multiple plot twists and the series’ first villainous team fake-out – and in doing so produce the richest cast of characters the Pokemon series has yet seen. Principal rival Hau is hardly a standout creation, but amongst the principle cast are characters with measurable arcs (gasp! ), sympathetic backstories, meaningful aspirations and surprising relationships. Also incredible battle music. There’s a genuine step up for the series’ writing as a whole here. Alolan Forms are simply brilliant. Mechanically, aesthetically, and marketing-wise the decision to introduce drastically different regional variants of first-generation Pokemon native to Alola was a masterstroke. These beauties effectively replace the need for the overpowered and difficult-to-balance Mega Evolutions from Gen VI in the now seemingly obligatory “nostalgia column” of Pokemon game design. 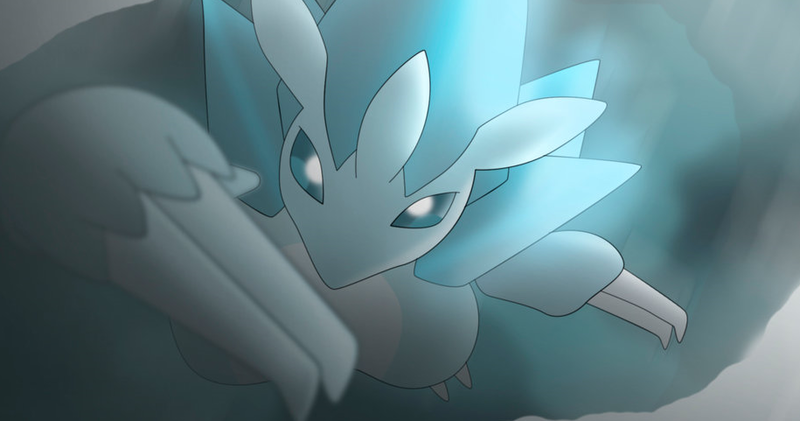 The creative challenge of using the same base stat total – sometimes the same exact stats – as a Pokemon’s original form and yet make it different enough to justify the moniker restricts the design team to making type, abilities and moveset go much further than normal – and as a result most of the Alolan Forms have intriguing functional niches and wonderful visual designs. The lore behind their inclusion – based on a different kind of evolution – only adds to the Alolan cultural tapestry, and the pressure to create more new Pokemon designs is lessened too, so there’s less risk of quantity outpacing quality. Alolan Forms even get their own unique music track when they evolve! Gen VII doesn’t have all that many glaring issues if you ask me, but the ones that are there usually come in the form of double-edged swords. For example, it’s all well and good to be successful at presenting a consistent mood throughout a region, but in a JRPG when that mood is pretty much just varying degrees of relaxation you come up against problems when you need stakes for the grandiose battles. In Sun/Moon, and ESPECIALLY in Ultra Sun/Ultra Moon, this manifests in three low-energy islands and then a drastically different fourth, where the friendly NPCs all but disappear, the tone rolls over into world-shattering drama and evil intentions are revealed. Even the few settlements that do exist on this island stand out from the crowd, with the novelty boatyard of Seafolk Village taking on a Poke Floats vibe and the Battle Tree providing the only competitive-class challenge gauntlet in the game. This gives the game’s pacing an unavoidable feeling that you’re doing a lot of waiting around before all the juicy stuff happens at once. I only realised this pattern recently, but it turns out I have some kind of bone to pick with the visuals of the second Pokemon generation to hit each gaming platform on which the main series has appeared. Don’t get me wrong – Game Freak’s ability to draw out such drastically different aesthetics from existing hardware is often impressive – and I do thoroughly enjoy what they’ve achieved with the remakes over the years. But in the case of the seventh Pokemon generation – which followed the wonderfully vibrant and visually dynamic sixth in alarmingly quick fashion – the art team’s vision exceeded their grasp. It’s quite clear that the 3DS isn’t quite able to handle the full implications of the shift to anatomically-correct human models, as the game’s frame rate slows to slideshow levels during several battles and big moments, even on the New 3DS models (which do perform better at least). The fully-animated models are impressive to be sure, but it’s clear that some noticeable compromises had to be made to ensure the game ran smoothly during most gameplay sections. 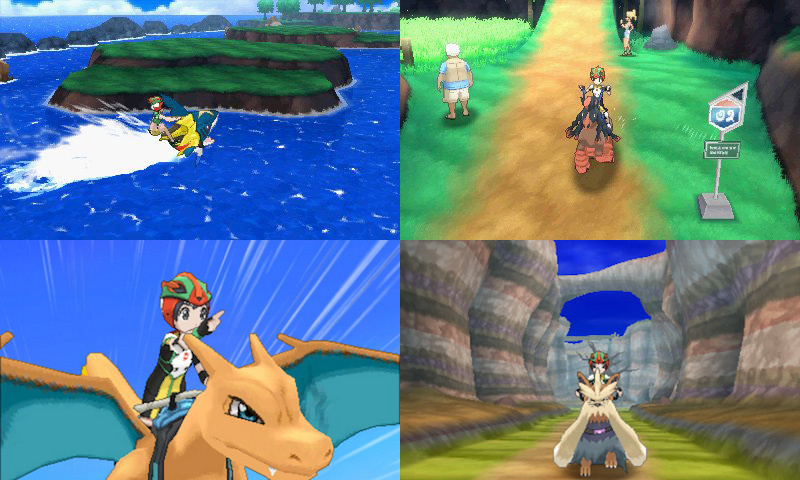 Textures in general show up at lower resolution than they did in Gen VI, the constant unchanging smile on the face of the player character has become a meme, and the exciting camera angle variation and sprinkling of stereoscopic 3D effects from the previous generation are nowhere to be seen. What’s more, lodged somewhere between the enthusiastic over-optimisation of the new visual style and that lovely consistent holiday vibe is the almost complete evaporation of distinct town aesthetics – a defining feature of previous Pokemon regions. Very few of them stand out in the memory – In fact right now as I write this only two towns come to mind – Seafolk and that farm-ish looking one. Umm… Paniola, according to Google. That’s it. Oh, you’ve never heard such a proclamation? Well there’s probably a fairly decent reason for that. 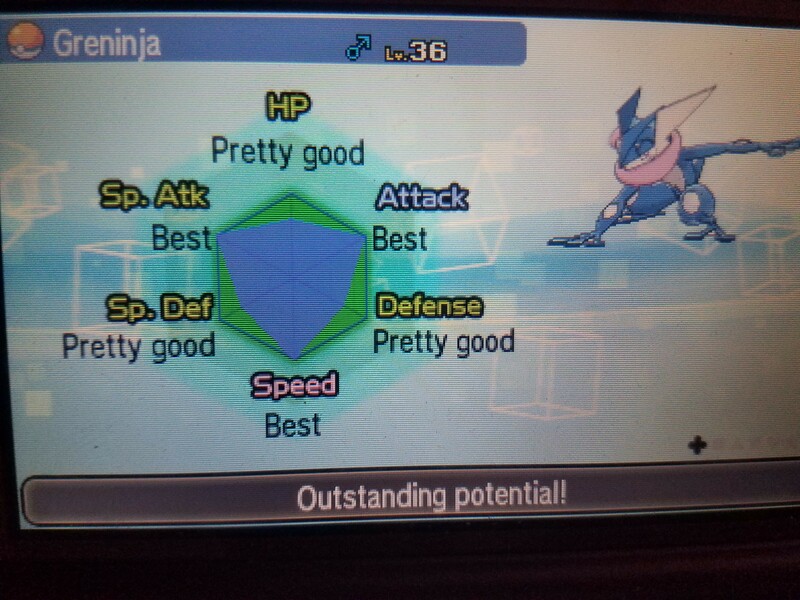 I’m beginning to think the brilliance of Pokemon X and Y‘s suite of social features was partly accidental, because the Gen VII games took both the functionality and the fun out of said suite and replaced it with a thoroughly confusing assault of distracting information that has you rely on not-insignificant servings of luck to get what you actually want out of it. Almost every piece of social and/or Pokemon improvement functionality requires at least two menu dives too many to access, finding your friends is an obtuse process to say the least and setting up the whole thing takes far too long, not to mention it’s an obligatory part of a game many already call too slow. Game Freak’s reputation for removing popular features from older games whenever a new pair is released is a source of great ongoing frustration for fans, but it has arguably never looked more bone-headed than it did with the festival plaza.